Last update after our first week back! It was a busy one and next week will continue to be so! 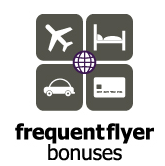 Over on the FrequentFlyerBonuses.com blog we summarize all the current buy miles and points bonus offers. While some aren't worth your time others like Alaska's and IHG's should definitely be looked into! Read all about it here. but also look at the link below on more details for the IHG promo! Big news south of the border sees American Express (U.S.) changing the terms on their Business Cards to only being able to earn the sign up bonus once per lifetime just like their consumer cards. Canada has the same rule on consumer cards but not business cards, so the question will not be if Canada will follow suit but when. - Earn up to 100,000 Avios when you apply for and receive the British Airways Visa Signature® Card.. More.. Residents of the US only Until ?